AKC Canine Health Foundation (CHF) has a keen interest in genetic counseling for dogs as an area of research and service. The Veterinary Genetics Laboratory (VGL) at North Carolina State University College of Veterinary Medicine is contributing to this effort through an online resource for pet owners and breeders to request genetic consultation with CHF-funded researcher Dr. Kate Meurs and her VGL Team. This is also a resource for veterinarians to inquire on behalf of a client’s canine genetics concern. Counsellors will include veterinary genetics researchers and NCSU faculty members including Dr. Kate Meurs (cardiology, genetics), Dr. Natasha Olby (neurology, genetics), current and former AKC/AKCCHF/TF Theriogenology Residents and other Theriogenology and Genetics faculty members through the VGL. 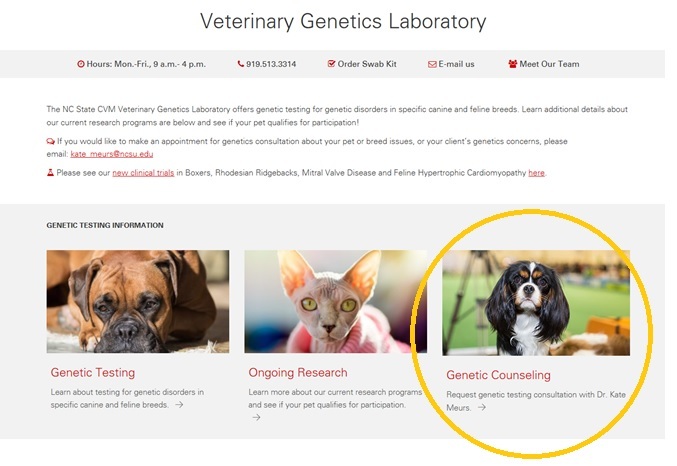 To take advantage of this genetic consultation service, please go to https://cvm.ncsu.edu/genetics/, select the Genetic Counseling icon to ask a genetics question about your dog or patient, and help continue forward progress for canine health. For questions, please contact chfgrants@akcchf.org.